From I-40, take exit 150 North on W. Military Dr. Continue on W. Military Dr, about 2 miles to the base gate. Military Dr turns into 7th. Continue on 7th through (stay to the right) the large intersection at S. Dakota Ave. The road curves past the aircraft displays and turns left onto 6th. Go NE on 6th about .4 miles to Omaha. Turn left on Omaha Ave. Campground is near the end of Omaha Ave on the left. Check-in is at Bldg. 5130. ---- The main gate closes at 5:30 pm so just follow the detour signs to the other gate which is at Camp Pike. You must then go to the post Police/Fire station to pick up your key to the electrical panel. After leaving the Police station, go back to the intersection and make a left up the hill. Go through 2 additional stop signs and at the next street (Omaha) make a left into the campground area. Active, National Guard, Reserves, Retired, DOD Civilians, Guests. Accepted. If you are arriving after hours, you should have a reservation or you won't be able to access the electrical panel. Small campground on a lake. No 30 amp electric. Not a good experience. Called ahead and gave them my equipment type, they set me up in the old section, which was the only site available. I don't think the most experienced driver could have gotten my 5th wheel into that site. I would have been happier if they had just told me they didn't have a site that would accommodate my camper. At least I wouldn't have wasted the time going there. We stayed here in our 35' motorhome. Found a nice pull thru spot and didn't even have to unhook the car. The Pike gate is now closed by order of the new commander so just come to the main gate. There was no lock on the power box (50A)so no problem there. We just drove in and found an empty spot then called billeting to tell them we were here. They had my CC info so we did not have to go to the office. There are basically 2 campgrounds next to each other. The first one is the old one and suitable for small trailers. The next one is the new one with all pull thru spots meant for big trailers and motorhomes. There are a lot of full timers in the campground that are stationed here or just live here. I was lucky there was one spot open when we got here in the new campground. 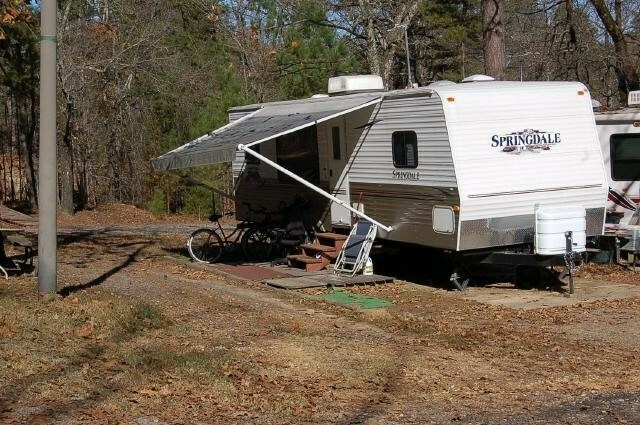 Pros; cheap -13.00 a night nice pull thru spot wooded but satellite dish worked for Dish 50 amp, water and sewer next to 2 lakes which are available for fishing Cons: no cable, I did not need it anyway no bathrooms or laundry no Wi-Fi at all. My wife and I loved it here. 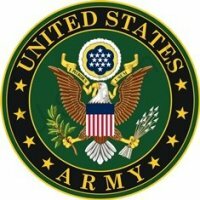 For those of you that have not stayed on a Army camp three times a day the base speakers come alive with reveille, TAPS, and lights out. Most of the slots are full with unaccompanied NCO's with wife's showing up on the weekend. Still it is very quiet. Trails and fishing with wooded areas all around. Check in through base billeting. Get off of I-40west on Military Drive about 2 miles. Have your ID cards ready. You guys go where ever you want to but I will be back. Thanks you Arkansas National Guard. Stayed in the new section (site 25) with full hookup (20, 39, 50 amp). The pad is plenty long enough for my 30ft 5thnwheel and it is level. Nice view of the lake. Most of the sites are still full of long term homesteaders but we had no problem getting a space. The price is now $13 per night. Camp Robinson has built several new sites that are all pull through with full hookups. 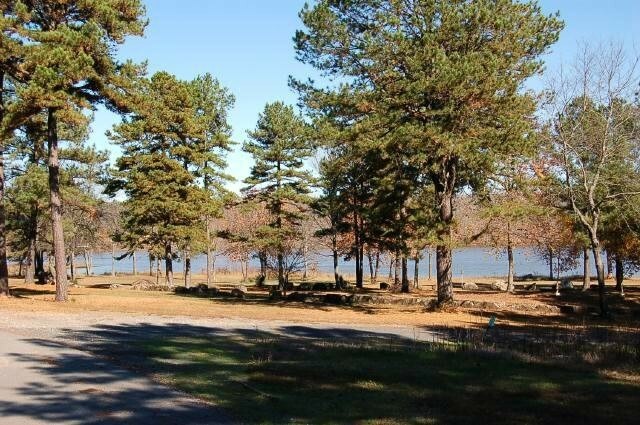 Very nice view of lake and in secluded area of post. Walking and running trails very close by and very scenic. Evidently no one has updated this in awhile. Camp Robinson has a large brand new park with full hookups, pull through pads and is very clean and friendly. The lake is beautiful and full of fish. Very nice place to stay for cheap. We stayed here in the new campground section while I attended a course at PEC. The new campgrounds have 50amp and 30 amp service and the pads are level. I will echo Roadtrek Guy's comments about the fulltimers, during our week here we only saw 1 other visitor - the rest were people on extended stays. The biggest downside to the campground was that it is built on a side of a hill and the pad locations on the extremely long pull through are staggered in a way that doesn't make sense. The pad length is good - our 38' fit on it with little problem, but the width is a problem given the slope of the hill. From the edge of our pad we had only 2 feet of gravel before it dropped nearly 3 feet to the next pad sight. There are still no fire rings, though there was a makeshift rock fire area and they had stacked plenty of firewood by it (for free). We saw prisoners cleaning the area so I assume they just leave the wood for their tenants. They do have nice plastic picnic tables now. Considering it was $11 for full hooks ups, it is pretty nice. I will also note that a number of the sites in the older part are empty and they are flatter (and smaller back in). The pictures online are of the older part and it appears some of it has been cleaned up. 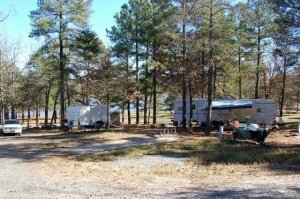 We stayed here in a completely new campground section, which is located next to the old location that is still also being used. The new section has 15 sites which are all pull thru, have water, sewer & electric. The view of the lake from the sites is outstanding, and all of the sites are very large and it is a quiet area for a military camp. We have never stayed at a family camp that made the sites so spacious as these. There are no restroom or shower facilities in the campground, so if that is what you desire, you might not like it here. If you either use your RV facilities or are willing to walk, drive or bike the 1/2 mile to the fitness center, the facilities there are outstanding. 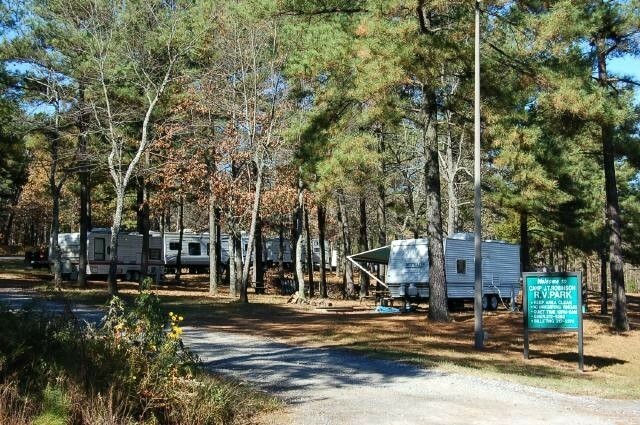 From what we can tell there are 5 or 6 of these new sites that stay occupied by full timers, and the old RV park seemed to be almost fully occupied by full timers. There are no camp hosts here which posed no problem for us. The check in for this camp is at the base billeting office, and when you sign in they give you a key that allows you access to the electric box on your site. The staff at the office were all kind and courteous. The lake is stocked and there is a nice trail around the lake for walking. The actual RV park, which has just been built earlier this year, is built so that all of the sights overlook the lake, so as a result, from the water up to the top camp sites it is a pretty steep incline. All of the drives are crushed rock, and each site has a concrete pad for the RV. The length of most of the pull thru's is probably 125 feet or so. We were amazed by that. So far, no picnic tables or fire rings, but I suspect since it was winter here, they will probably add those this spring or summer. We ended up staying here much longer than we first thought we would, and thoroughly enjoyed our stay. At $11.00 per night, we felt it was an outstanding value. Drove over to the RV park to check it out. We have a Class B so we can get around most places. As everyone said, the park is full of long term guests. There were three or four slots open but there were big branches and broken limbs all over the spots. I decided that I didn't want to chance it since it was forecasted for rain and wind. Instead friends invited us to their house. I was planning on going to Little Rock AFB, it's close and reported to be much nicer for the same price. P.M. left this review using the Directory software: Small campground on a hill, the road into the campground itself is steep and in poor condition but my 30'A pulling a toad made it just fine. Site is mostly level (old concrete pad) electric and water worked. This is a campground, not an RV park. For camping it works quite well, has a park on a lovely lake. It is old and not well maintained but you could call it rustic and be correct. If you are camping it is great, not so good for the RVer. Base small but well kept and had all basics. Billeting office was helpful and put me in space 15 which was easy for the A to back into. I would suggest sites 15 or 16 for bigger rigs. Smaller rigs could park anywhere. Do need to be self-contained, no amenities. Stopped by for a look and update of the information. Not as bad as I expected, based on the previous reviews. However, this isn't a high class RV Park. Sites are on a hill and are not laid out well. It would be difficult to get into some of the sites. 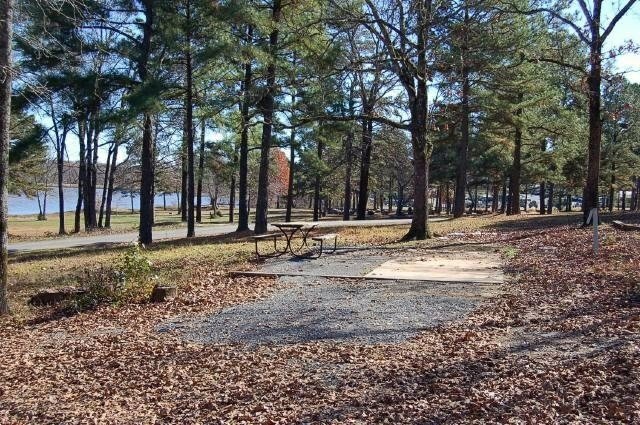 Campground is old and neglected. It does appear most of the campers there are long term. However, there were a few available sites and some were in a good location and easy to pull into. Sites and road isn't made for larger rigs. As long as you don't expect too much, these sites are a fair deal. Located across the street from a small lake. If there were a rating lower than 1 I would have rated them lower. Very poor campground - so bad in fact we refused to even try to stay there. Even the directions to the site are very poor. Further, the phone numbers listed provide no assistance. Their stock answer is "you just have to come and look at it." They had no knowledge of site size, power, or other facilities. 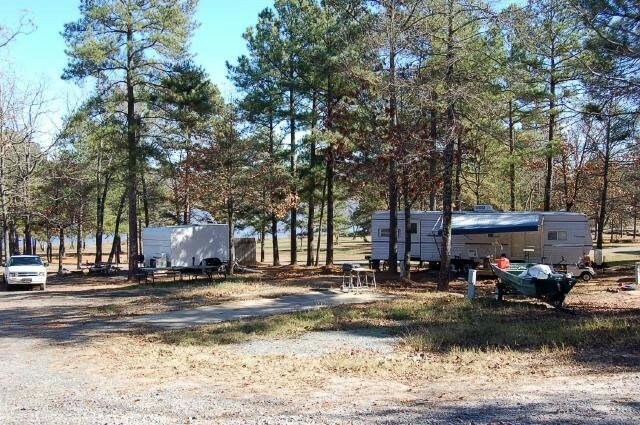 This camp site should be removed from the listing until the CO makes some major changes. Didn't stay, wouldn't stay! Checked it out for further reference and glad we drove the Jeep in and not the motorhome. The road in is pot-holed gravel, the interior roads are washed out gravel. Un-mowed and un-kept. Hilly terrain with camp sites all helter skelter. The "campground" is full of homesteaders who seem to store everything they own all around and under their RV's. Even at $7 it is not a bargin. If the ratings had a "0", I would have given it all zeros. The location is the ONLY thing this campground has going for it. It could be a real gem on a small lake.